The PDO raisins of Zakynthos drying in the sun. Greece’s westernmost islands feature strong Italian influences and their own exciting cuisine. The Ionian islands, or the Heptanese, are nothing if not privileged. With fertile soil, plenty of rain and just the right amount of humidity, anything you plant here takes root and grows. This arability shaped the islands’ rural customs as well as their cuisine, but they were also influenced by the Western powers that held sway here, particularly the Venetians. Is it cheese you want? 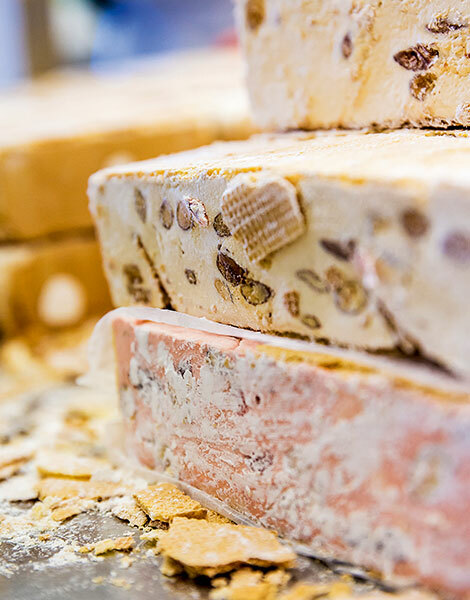 Kefalonia produces one of the best feta cheeses in Greece – although legally it cannot be marketed as such, but as “white cheese in brine” – and Zakynthos’ ladotyri (cheese preserved in oil) is just incredible, tangy and robust. Cold cuts? You can’t beat Lefkada’s salami, Corfu’s noumboulo (smoked cured pork) or Zakynthos’ pork shoulder. And then there’s the rich butter, the raisins, the top-quality olive oil, wines from at least 20 different grape varieties, crackling fragrant breads made with local grains, potfuls of honey and a cornucopia of fruits and vegetables. Pastitsada - a Corfu Speciality. 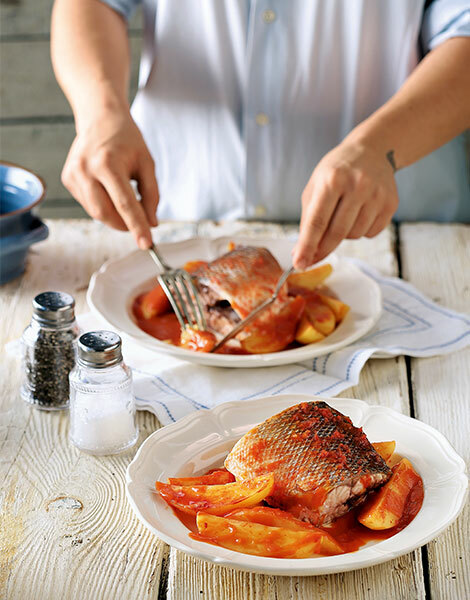 Grey mullet in a tomato sauce. Ionian cuisine consists of hearty, rustic gems like pastrokio (eggplant baked in a tomato sauce with eggs and cheese) and sophisticated dishes once reserved for the nobility, such as sofrito (thinly sliced veal in a delicate garlic sauce). It’s a voluptuous cuisine, filled with sauces and rich with flavor. The people here celebrate seasonal vegetables, favor a bit of spice, love garlic, tomatoes and parsley, and create unusual dishes with every type of meat. Where can all this deliciousness be found? Mainly at smaller tavernas in out-of-the-way villages, the humble eateries favored by locals. 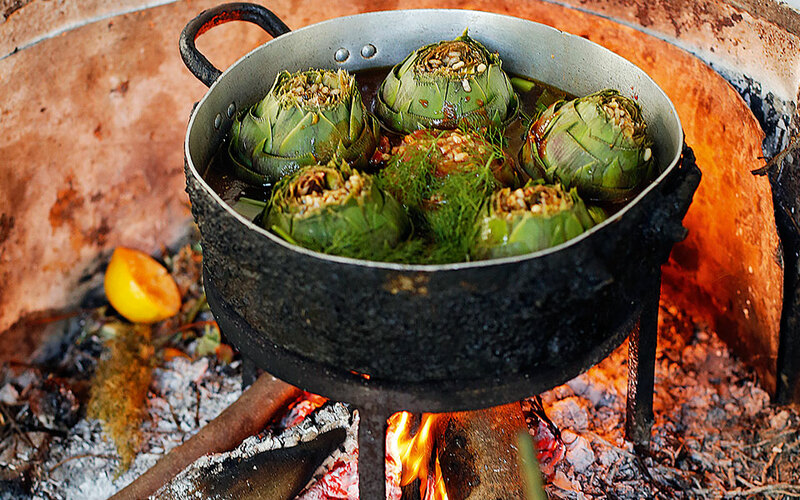 There are also a handful of restaurants in the capital of each island that respect local ingredients and traditions, and whose chefs are known for presenting the kind of food their mothers and grandmothers prepared at home in their padellas, which is how cooking pots are known in this area. Mantolato - a local nougat treat. Look for the local “feta” in Kefalonia, sold in supermarkets, grocery stores and tavernas, and for Prentza, a spicy cheese flavored with summer savory. Don’t leave Lefkada without some of its peppery salami and a bag of local lentils. The stars of Zakynthos are its ladotyri, a cheese aged in olive oil, and its PDO sweet and fleshy raisins. Kythira is known for its olive oil rusks and its amazing thyme honey. Corfu’s jewels include noumboulo – a cured pork or beef coldcut – as well as kumquat (in a liqueur or as a sweet preserve). Search here for spetseriko, a fiery 12-spice blend whose secret recipe dates back centuries. Everywhere, you’ll find traditional sweets such as pasteli (sesame-and-honey snaps), mandolata (nougat with nuts and merengue), and mandoles, made with almonds, honey and sugar. Sofrito, a veal stew which hails from Venetian times, pastitsada (beef cooked in a rich tomato sauce and served with thick pasta) and bourdeto (fish in a spicy tomato sauce) are the signature dishes of Corfu, along with other casseroles cooked inouminto, meaning without water but with lots of fresh grated tomatoes. 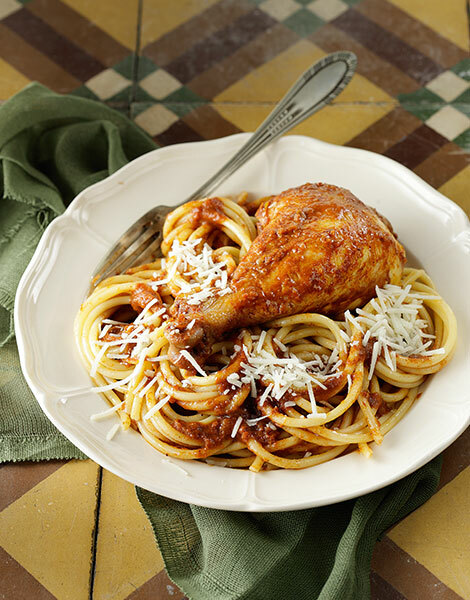 Zakynthos’ culinary highlights include rooster in tomato sauce served with pasta and grated ladotyri, and eggplants cooked in a delicious vinegary, garlicky sauce. The manestra (a vegetable stew with a velvety egg-lemon finish) is also delicious. Kefalonia’s octopus pie is to die for, while in Lefkada they make a whitebait pie that will have you licking your fingers. Rooster with fava at Familia, Kythira. In Kiliomenos on Zakynthos, Ampelostrates (Tel. +30 26950.437.18) serves a delicious dish of stuffed spleen, a rich beef ragu and handmade mini-pies stuffed with wild greens, accompanied by local bottled wine. On Kythira, Familia (Tel. 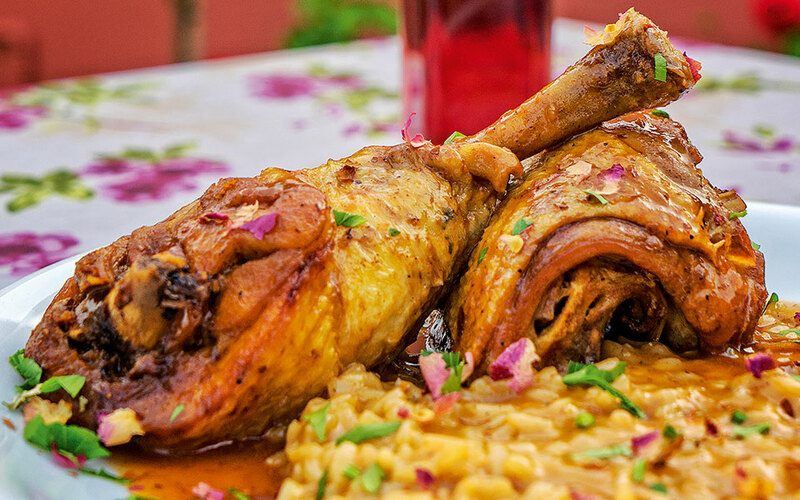 +30 27360.339.08), a restaurant located on the main square in the village of Fratsia, is known for its lamb scented with fennel seeds and for its tsipouro (a strong spirit). In Corfu’s Old Town, Kokoria (Tel. +30 26610.350.02) is the place to go for well-executed classics like pastitsada, sofrito and bourdeto. The Ionian islands enjoy a mild climate with abundant rainfall, in sharp contrast to the arid environment of the Cyclades. Here, the sea is the color of sapphires and the hillsides abound with pine and olive trees that can, in places, stretch all the way down to beautiful unspoiled beaches. The islands’ distinct cultural identity is the product of strong Italian influences, as the Ionian group avoided Ottoman conquest and remained under Venetian rule. The undisputed oenological star of this region is Kefalonia, the leading Ionian island in terms of viticulture, and the only one to possess three different PDOs. Rugged, steep and topped by the imposing peak of Mt Ainos, Kefalonia is a Noah’s Ark for grape varieties, with prodigious vine biodiversity. Of all its varieties, perhaps the most important is the elegant and refreshing Robola, which produces some of the finest whites in Greece, especially on the high limestone slopes of Ainos. Floral and rich in character, it has herbal undertones, a high level of complexity and a moderate capacity for aging. 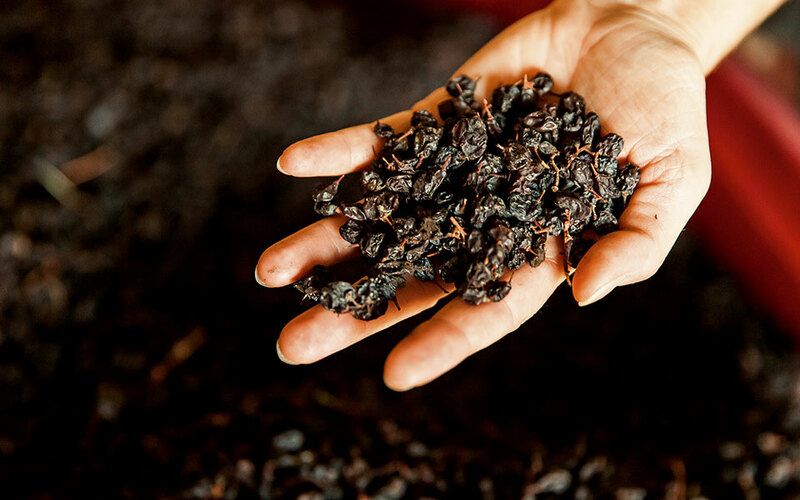 Other notable local grapes are Tsaousi, Vostilidi, Zakynthino, Moschatela and Tsigelo, the small-berried clone of Mavrodafni that is now being vinified in exotically fragrant dry versions. 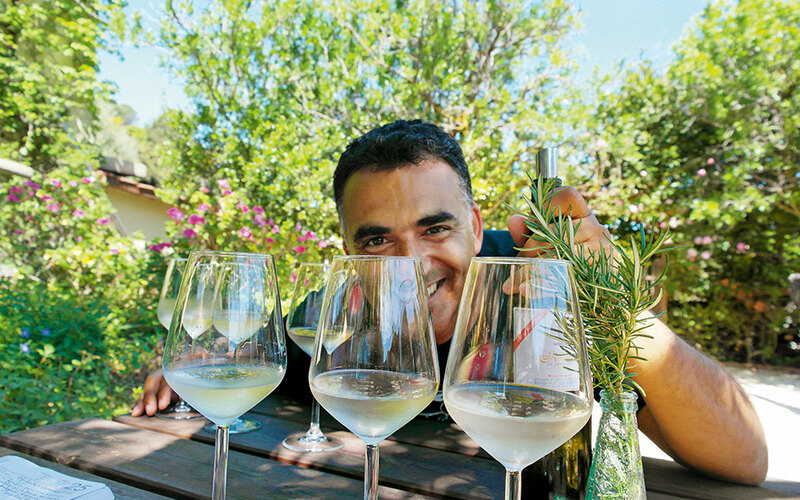 Wineries to look out for include Foivos, Gentilini, Haritatos, Petrakopoulos, Sclavos and the local Robola cooperative. The wine scene is quieter on the other Ionian Islands, but there are gems to be found. Zakynthos is best known for its Verdea, a traditional, multi-varietal dry white that is aged for several years. 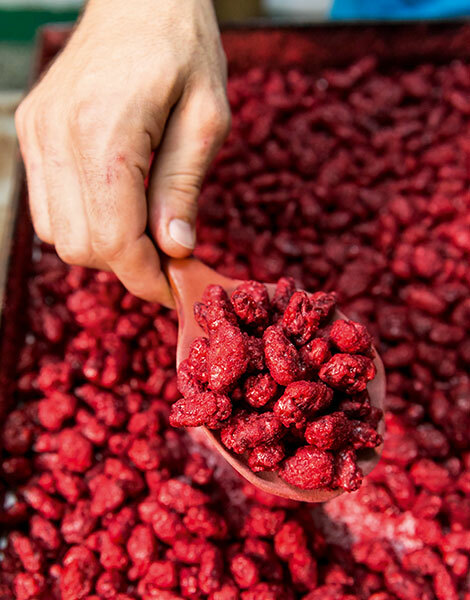 Lately, however, major strides have been made with the Avgoustiatis variety, used by the Grampsas Winery to make a mild red dry wine with complex red fruit, flower and spice aromas. The wine scene is limited on Corfu and Lefkada, but the varieties of Kakotrygis on the former and Vertzami on the latter deserve to be mentioned.